I'm trying to figure out why this was shown at 2008's New York Film Festival. At the same time I'm so incredibly happy that I didn't see it there and over paid for the privilege to watch paint dry. The plot of the film has an internet addicted teen at a prep school who is so disconnected with the world that the only thing real is what he sees in the You Tube clips or through his video recorder accidentally record the drug overdose of two of the girls in the school. We then watch as events play out. 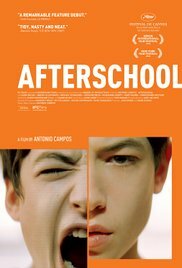 Long dull shots framed off kilter so as to cut off peoples heads combine together to reveal a story about teen life that is so artificial that you'd have to have limited exposure to either children or the films about them to truly be shocked at revelations. Alienation? Who would have thought? Drug Use? Amazing.Adults that are condescending and don't listen? Who knew? I kept waiting for something to happen, but nothing did. When the overdose occurs, I'm not sure how long into the film, a good distance, I was bored so my sense of time was all screwed up, I figured that the film would pick up. It really didn't. Honestly they sort of lost me with the opening montage of viral clips. One instantly got a sense of where it was going and what the filmmakers were going to be saying and the film didn't disappoint. I thought for awhile that the off kilter camera was always from the hero's point of view and then I realized that not, his head was chopped off sometimes too. Sometimes you wonder why a film can play something as prestigious as the New York Film Festival and not get a distribution deal or one that delays the release for a year or more, thats not the case here, its clear why no one picked it up, its dull and far from revealing. As I said at the outset the real question is how this dull little film ended up in any film festival at all.